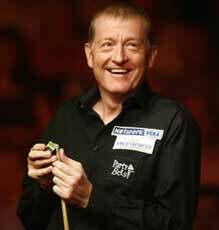 Steve Davis, OBE (born 22 August 1957) is an English professional snooker player from Plumstead, London. Known for dominating the sport during the 1980s, when he won the World Championship six times and was ranked world number one for seven consecutive seasons, he is remembered particularly for contesting the 1985 World Championship final with Dennis Taylor, the black-ball conclusion of which attracted a record 18.5 million British viewers. He is a well known public figure and is generally viewed by his peers as one of the greatest players of all time. Today, Davis combines his ongoing playing career with his role as a television analyst and commentator for the BBC's snooker coverage, alongside being a DJ of electronic music on local radio station Phoenix FM and at the Bloc Weekend music festival. In addition to his six world titles, Davis's career achievements include three Masters and a record six UK Championship titles. He has won a total of 28 ranking events, tied with John Higgins and Ronnie O'Sullivan, and behind only Stephen Hendry, and has won over £5.5 million in prize money. Davis has compiled more than 350 competitive century breaks, including the first officially recognised (and first televised) maximum break in professional competition, in 1982. During the 1987/1988 season, he became the first player to complete snooker's Triple Crown by winning the UK Championship, Masters, and World Championship in the same season. His other accomplishments include winning the World Doubles Championship four times with Tony Meo and winning the World Team Classic/World Cup four times with England. Davis won his last world title in 1989, and captured his last major title when he won the 1997 Masters at the age of 39, but he has continued to play snooker at a high level into his 50s. 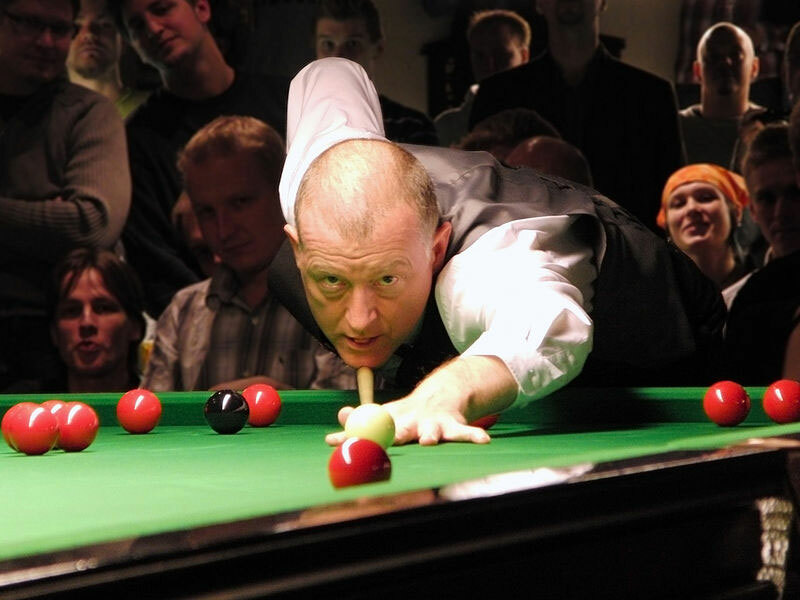 He reached the final of the 2005 UK Championship at the age of 48 and was still ranked inside the top 16 when he turned 50 during the 2007/2008 season. He reached the quarter-finals of the 2010 World Championship at the age of 52, making him the oldest quarter-finalist since Eddie Charlton in 1983. He won the World Seniors Championship in 2013. Outside snooker, Davis has competed in pool tournaments, notably playing on Team Europe at the Mosconi Cup between 1994 and 2004, helping the team win the event in 1995 and 2002. He is also noted for his participation in poker events, having reached the final stages of several televised tournaments. Since 1996 he has been a regular broadcaster with Phoenix FM and an expert in the progressive rock genres of Zeuhl, RIO and the Canterbury scene. A keen amateur chess player, he has co-authored two chess books with grandmaster David Norwood and is a former president of the British Chess Federation. He has also published several books on snooker, as well as three cookbooks. He has appeared on a number of popular British TV shows, including I'm a Celebrity...Get Me Out of Here! in 2013. He was made an MBE in 1988 and an OBE in 2001. Davis was introduced to snooker by his father Bill, a keen player, who took him to play at his local working men's club at the age of 12, and gave him Joe Davis' instructional book How I Play Snooker. They studied the book and built Steve Davis's own technique on it in the 1970s. He started playing at the Lucania Snooker Club in Romford, where at the age of 18 the manager of the club brought his talent to the attention of Barry Hearn, chairman of the Lucania chain of snooker halls. Hearn became Davis' friend and manager. Paid £25 a match by Hearn, Davis toured the country, taking part in challenge matches against established professionals such as Ray Reardon, John Spencer and Alex Higgins. Around this time he was given the nickname "Nugget" because, according to Hearn, "you could put your case of money on him and you knew you were going to get paid." Davis won the English Under-19 Billiards Championship in 1976. One of his last wins as an amateur was against another future professional Tony Meo in the final of the Pontin's Spring Open of 1978. A year later he successfully defended his title, this time defeating another of his future rivals, Jimmy White, 7–4 in the final. Davis turned professional on 17 September 1978 and made his professional television debut on Pot Black, where he played against Fred Davis. He made his World Championship debut in 1979, losing 11–13 to Dennis Taylor in the first round. Davis came to public prominence after his performance at the 1980 World Championship, where he reached the quarter-finals, defeating defending champion Terry Griffiths en route, before losing to Alex Higgins. Davis won his first major title in the same year – the UK Championship – during which he beat Griffiths 9–0 in the semi-finals and Higgins 16–6 in the final. This began an 18-month period of dominance. He won the Classic and then the International Masters and English Professional titles in 1981, and became the bookmakers' favourite to win the 1981 World Championship, despite being seeded only 15. Davis reached the final by defeating Jimmy White in the first round, Higgins in the second round, Griffiths in the quarter-finals and defending champion Cliff Thorburn in the semi-final. Davis's 18–12 victory over Doug Mountjoy in the final confirmed bookmakers' early predictions, and in celebration his manager Barry Hearn charged across the arena to lift him up in the air. He would go on to reach seven out of the next eight world finals. Peculiarly, Davis's first four world finals were each against a player of a different nationality, something that had not occurred before or has since. He followed up his world title win with a 9–0 final victory over Dennis Taylor in the International Open and then retained the UK Championship with a 9–0 whitewash over White in the semi-finals and a 16–3 win over Griffiths in the final. This began a period of six months in which Davis and Griffiths contested almost all the major tournament finals. During this run, in January 1982, Davis made snooker history when he compiled the first televised maximum break at the Classic at the Queen Elizabeth Hall, Oldham, against John Spencer. Davis won a Lada car for the achievement. Davis subsequently lost 9–8 in the final against Griffiths. In 1982, Davis won his first Masters title, defeating Griffiths 9–6 in the final. Davis's 18-month period of dominance ended at the 1982 World Championship, when he succumbed to the so-called "Crucible Curse", losing 10–1 against Tony Knowles in the first round. Later that year, he couldn't win a third consecutive UK title as he lost in the quarter-finals against Griffiths. Following those two setbacks, he won the World Doubles Championship title with partner Tony Meo. In 1983 Davis regained the world title with a session to spare in the final, defeating an overwhelmed Thorburn 18–6; Thorburn had seen his previous three matches go to a deciding frame and a late finish. Davis lost 16–15 to Higgins in the 1983 UK Championship final, despite having led 7–0 at one point of the match. In 1984, he became the first player to retain his world title at the Crucible Theatre by beating Jimmy White 18–16 in the final. 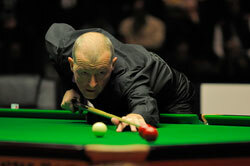 He also regained the UK title in 1984 defeating Higgins 16–8. At the 1985 World Championship, Davis dropped only 23 frames en route to the final, where his opponent was Dennis Taylor. He looked set for a third consecutive world title after an opening session of near-faultless snooker gave him a 7–0 lead, which he extended to 8–0 in the evening session, but Taylor recovered to trail only 7–9. From 11–11 the pair traded frames before Davis forged ahead to lead 17–15. Taylor won the next two frames to level the match at 17–17 and force a deciding frame. With the scores close, Taylor potted the final colours to leave the black as the winner-takes-all ball. After a series of safety shots and attempts at potting it, Davis over-cut the black, leaving Taylor with a reasonably straightforward pot to secure the championship. The nailbiting finale drew 18.5 million viewers, a record post-midnight audience on British television and a record audience for BBC Two. The black-ball finish was voted the ninth greatest sporting moment of all time in a 2002 Channel 4 poll. Davis and Taylor met again in the final of the 1985 Grand Prix, but this time Davis won in the deciding frame. At 10 hours 21 minutes, it remains the longest one-day final in snooker history. In the 1985 UK Championship final Davis trailed 8–13 against Willie Thorne, who missed a blue off the spot which would have given him a 14–8 lead. Davis won the frame and then seven of the next eight to win 16–14. At the 1986 World Championship, Davis defeated White 13–5 in the quarter-finals and Thorburn 16–12 in the semi-finals, Davis's opponent in the final was Joe Johnson, who had started the tournament as a 150–1 outsider. Davis lost the match 12–18. The result did not affect his position at the top of the world rankings, as he had won the UK Championship, the Grand Prix and the British Open in the 1985/1986 season. At the end of 1986 he beat Neal Foulds 16–7 to retain the UK Championship. Davis started 1987 by winning the Classic, beating defending champion Jimmy White 13–12. At the World Championship, he defeated Griffiths 13–5 in the quarter-final, and White 16–11 in the semi-final. In the final he again met Johnson, and established a 14–10 lead after three sessions. Johnson reduced Davis' lead to 14–13, but Davis won four of the next five frames to win the match 18–14 and regain the title. In beating Johnson he became the first player to win the UK Championship, Masters and World Championship in the same year. In December he retained his UK title with a 16–14 final win against White. In 1988 retained the Classic, claimed his second Masters title with a 9–0 final whitewash of Mike Hallett (the only final whitewash in the event's history), won the World Cup with England and won his fourth Irish Masters title. In the World Championship Davis defeated Hallett 13–1, Tony Drago 13–4 and Thorburn 16–8 en route to the final, where he met Griffiths. Davis established a 5–2 lead after the first session, but Griffiths levelled at 8–8 after the second. On the second day of the match Davis took ten out of thirteen frames to win 18–11 and claim his fifth world title. Davis won the first ranking event of the 1988/1989 season with a 12–6 win over White in the International Open; in the same match, he became the first player to make three consecutive century breaks in a major tournament. In October, Davis won the Grand Prix, beating Alex Higgins 10–6 in the final to hold the World, UK, Masters, Grand Prix, Classic and Irish Masters titles simultaneously. However, his four-year unbeaten run at the UK Championship came to an end in December with a 3–9 semi-final loss to Hendry. He did not win another major title that season until the 1989 World Championship, where he beat Hendry 16–9 in the semi-finals before going on to complete the heaviest victory in a world final of the modern era with an 18–3 win over John Parrott, his last world championship to date. In October he retained the Grand Prix, beating Dean Reynolds 10–0 in the final, the first whitewash in a ranking event final. By the end of the 1980s, Davis was snooker's first millionaire. In the 1990 World Championship, Davis was denied an eighth consecutive appearance in the final by Jimmy White, who won their semi-final 16–14. Davis was replaced as world number one by Stephen Hendry at the end of the 1989/90 season. He was ranked number 2 for the 1990/1991, 1991/1992, 1994/1995 and 1995/1996 seasons. He reached the semi-finals of the World Championships in 1991 and 1994. He also won the Irish Masters in 1990, 1991, 1993 and 1994, the Classic and the Asian Open in 1992, the European Open in 1993, and consecutive Welsh Open titles in 1994 and 1995. His successful defence of his Welsh Open title in 1995 is to date his last ranking title. Davis's last victory in a major tournament came at the 1997 Masters. Trailing his opponent Ronnie O'Sullivan 4–8 in the final, he won the next six frames to secure a 10–8 win. After a season which saw Davis reach only one ranking event quarter-final, Davis dropped out of the top 16 for the 2000/2001 season, and failed to qualify for the World Championship for the next two years. After failing to qualify for the World Snooker Championship for the first time in his professional career in 2001, Davis felt that retiring would be the easy thing to do, but as he still liked the challenge of snooker, he continued playing, and regained his place in the top 16 for the 2003/2004 season. He was runner-up in the 2004 Welsh Open to O'Sullivan, losing 8–9 after having led 8–5. In 2005 he reached the quarter finals of the World Championship, losing to eventual winner Shaun Murphy. At the 2005 UK Championship, held in York, Davis reached his 100th major career final, and made his first appearance in the UK final since 1990. En route he beat defending champion Stephen Maguire 9–8, a win which included a 145 break; and then Stephen Hendry 9–6 in the semi-finals to reach the final, where he lost 6–10 against Ding Junhui. Before the World Championships Davis brushed off suggestions of retirement, and he reached the second round, where he lost to Murphy. Davis's performances through the 2006/2007 season, including reaching the UK Championship quarter-finals and the Welsh Open semi-finals, ensured he was still a top 16 player at the age of 50. He dropped out of the top sixteen a year later, but showed form in the 2008/2009 season by reaching the quarter-finals of both the Shanghai Masters and Grand Prix, the first time he had reached consecutive ranking event quarter-finals since 1996. At the World Championship Davis lost in the first round 2–10 against Neil Robertson. After the match he again dismissed talk of his retirement. In the first two tournaments of the 2009/2010 season Davis failed to qualify for the televised stages as he lost 4–5 against Matthew Selt in the Shanghai Masters and 0–5 against Mark Davis in the Grand Prix. In the next tournament, the UK Championship, he defeated Michael Judge 9–7 to set up a first round match against Hendry, which he lost 6–9. Davis started 2010 by failing to qualify for the Welsh Open and the China Open, losing 2–5 against Dominic Dale and 3–5 against Mike Dunn respectively in the final qualifying round. In March he qualified for the World Championship for a record 30th time by defeating Adrian Gunnell 10–4. In the first round Davis defeated Mark King 10–9, becoming, at the age of 52, the oldest player to win a match at the Crucible since Eddie Charlton beat Cliff Thorburn in 1989. In the second round against defending champion John Higgins, a 1–20 favourite, Davis led 6–2 after the first session, 9–7 after the second session, and ultimately won 13–11, a win Clive Everton described as "the greatest upset in the 33 years the Crucible has been hosting the championship." This made him the oldest world quarter-finalist since Charlton in 1983. In the quarter-final match against Australian Neil Robertson, Davis recovered from a 2–12 deficit to force the match into the third session, eventually losing 5–13. On 29 April 2010, to mark the 25th anniversary of their black-ball final of 1985, Davis appeared with Dennis Taylor before the beginning of the first semi-final, to stage a humorous re-enactment of their historic final frame. Taylor entered the arena wearing a pair of comically oversised glasses, while Davis arrived sporting a red wig. Davis started the 2010/2011 season by qualifying to the televised stages of Shanghai Masters, whitewashing Rod Lawler 5–0, but lost in the first round 3–5 against Jamie Cope. He lost his qualifying matches in the next two tournaments, he lost 1–3 against Peter Ebdon in the last 64 of the World Open and 2–9 against Mark Joyce in the last 48 of the UK Championship. He also participated at the Players Tour Championship, where his best results came at the Paul Hunter Classic, where he reached the quarter-finals, but lost 1–4 against Shaun Murphy. He finished 67 on the Order of Merit. Davis also reached the final of the World Seniors Championship, but lost in the final 1–4 against Jimmy White. He reached the third qualifying round of the German Masters, but was whitewashed by Ryan Day 0–5. Davis lost his first qualifying matches of the next two tournaments. He was beaten by Joe Jogia 3–4 in the Welsh Open and 4–5 by James Wattana in the China Open. He narrowly reached the last qualifying round of the World Championship, by defeating Jack Lisowski 10–9, but lost against Stephen Lee 2–10. Davis started the 2011/2012 season at number 44, his lowest rank since turning professional. He lost his first qualifying match at the Shanghai Masters 1–5 against Passakorn Suwannawat. After 2010 he reached the final of the World Seniors Championship, but again lost in the final, this time 1–2 against Darren Morgan. Davis also participated at the Players Tour Championship, where his best results came at the Warsaw Classic, where he reached the semi-finals, but lost 3–4 against Ricky Walden. He finished number 26 on the Order of Merit. He qualified for the UK Championship, by defeating both Ian McCulloch and Andrew Higginson 6–2, but he couldn't qualify to the German Masters as he lost 1–5 against Robert Milkins and also lost in the first round of the UK Championship 1–6 against Ronnie O'Sullivan. Davis then missed the World Open, as he lost his first qualifying match 1–5 against Ian McCulloch, but reached the last 16 of the Welsh Open with three 4–3 victories, defeating Lucky Vatnani, Ricky Walden and Allister Carter, before losing 0–4 against Shaun Murphy. However he then didn't qualify for either the China Open, nor the World Snooker Championship, losing 1–5 to Rory McLeod and 7–10 to Ben Woollaston respectively. Davis started the 2012/2013 season at number 51, but couldn't qualify for the first two ranking events, as he lost 3–5 against Kurt Maflin at the Wuxi Classic, and 0–5 against Michael Wild at the Australian Goldfields Open. Davis took part in the Six-red World Championship, where he finished third in Group E with three wins out of five matches and advanced to the knock-out stage, but lost 1–6 against Mark Davis in the last 32. Davis qualified for the Shanghai Masters by defeating Alfie Burden 5–1 and Andrew Higginson 5–0. There he defeated Zhu Yinghui 5–1 to reach the last 32, but lost 4–5 against Ricky Walden. He however couldn't qualify for the International Championship after losing his first qualifying match 5–6 against Pankaj Advani. Davis then qualified for the final stages of the UK Championship by defeating Advani 6–5 and Jamie Burnett 6–2, but lost 2–6 against Ali Carter, and he also lost his first qualifying match at German Masters 4–5 against Simon Bedford. Davis also participated at the Players Tour Championship, where his best results came at the Kay Suzanne Memorial Trophy and the Scottish Open, where he reached the last 16, but lost 3–4 against John Higgins and 1–4 against Ding Junhui respectively. He finished number 52 on the Order of Merit. Davis then lost at the qualifying stages of the next two ranking events. He lost 4–5 against Chen Zhe at the World Open, and 0–5 against Mark King at the China Open. At the Welsh Open he defeated Kurt Maflin 4–2 to qualify for the venue stage of the event, where he lost 0–4 against Mark Selby. Davis finished the season in the qualifying stage of the World Championship by losing 7–10 against Maflin. Davis started the 2013/2014 season at number 51, and his first match was in the qualifying stages for the Wuxi Classic, where he faced James Cahill. After Cahill levelled the match at 2–2, Davis won the next three frames in a row, along with a 131 break in the penultimate frame, to book his place for the main stage of the tournament in Wuxi, where he lost 1–5 against Andrew Higginson in the last 64. Davis then lost at the qualifying stages of the next two ranking events he entered. He lost 2–5 against Higginson at the Shanghai Masters, and 1–4 against Thanawat Thirapongpaiboon at the Indian Open. He than qualified for the International Championship with a 6–2 win against Allan Taylor, but lost at the venue 1–6 against Zhao Xintong in the wildcard round. Davis won his first World Seniors Championship title by defeating Nigel Bond 2–1 in the final. After a defeat by Craig Steadman 8–10 in the second round of the 2014 World Snooker Championship qualification, Davis finished the season outside the top 64 in the money list and dropped off the professional main tour after 36 years. Given an invitational tour card to participate in tournaments for the 2014-15 season, Davis made his return to competitive snooker in the Riga Open in August 2014, losing 1-4 to Robert Milkins in the last 64. He then participated in the Paul Hunter Classic, losing 2-4 to Gary Wilson in the last 128. Davis played in the 2014 Champion of Champions event after qualifying through winning the 2013 World Seniors Championship, losing 1-4 to Mark Selby in the group semi-final. In 1988, Davis was named the BBC Sports Personality of the Year and was made a MBE. He was awarded an OBE in 2001, and is currently honorary president of the Snooker Writers' Association. Davis is a big fan of the French progressive rock band Magma, and even organised a concert in London so he could watch them. Davis is on the board of Leyton Orient football club; he has been a Charlton Athletic fan most of his life. Davis lives in Brentwood, Essex, and divorced from his wife Judith in 2005 after 15 years of marriage. They have two sons called Greg (born 1991) and Jack (born 1993). In 2012, Greg Davis entered the Q School, with the aim of winning a place on the professional snooker tour. He was a supporter of the Conservative Party.